Next time you’re dining out with friends or family, try an establishment that works on a social or environmental issue close to your heart. Perhaps you want to support local farmers to reduce your food miles? Try eating somewhere with a seasonal menu made of local produce. Maybe you want to lower your meat consumption and associated methane emissions? Test out a plant-based or vegan restaurant. Want to help those who experience barriers to work? Opt for a social enterprise. Native offer a unique dining experience with delicious dishes made from wild and foraged ingredients native to the UK. Their seasonal menus are full of flavour and are always presented so beautifully – perfect for a special dinner with a loved one. 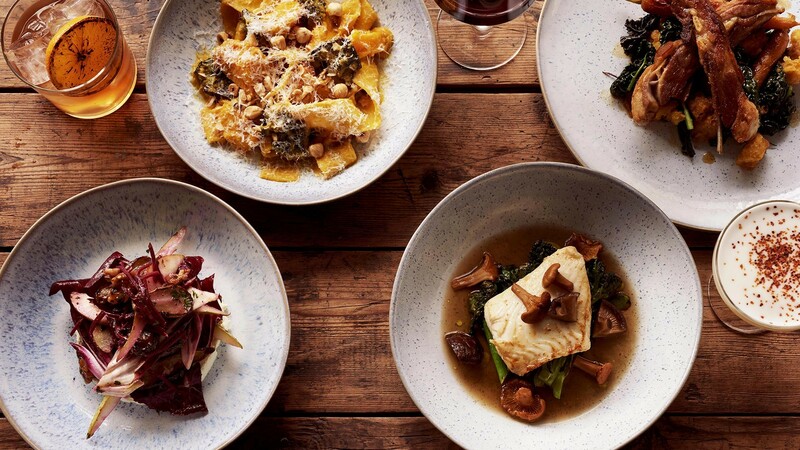 Starting as a pop-up above a cheese shop in Brixton’s Market Row, Salon is now a permanent restaurant with a seasonal menu changing week by week. Committed to using UK produce, their food is guided by the seasons. They also have a bar with a range of cocktails, artisanal spirits, craft beers and low intervention, organic and biodynamic wines, which they sell to-go in the Wine Store that they opened next door. Cub is an exciting and inspiring collective project from Mr Lyan, Doug McMaster, Krug Champagne, Belvedere and LVMH, Dr Arielle Johnson and many others. They careful consider the ingredients and methods used to create a delicious dining experience made in a more sustainable manner. With a focus on waste, surplus ingredients and food waste is collected and composted at Indie Ecology’s farm in West Sussex. Cub have a plot at this farm where they grow their own fruit and veggies to be used in the restaurant for a more circular system. Tiny Leaf is London’s first organic, vegetarian and zero waste to landfill restaurant. Using surplus stock and leftovers from local shops, farms and distributers, as well as growing their own, they aim to make use of unwanted food. Their leftover ingredients are then used for juicing or are composted. Touring London having had two residencies so far, the first in Westbourne Park and the second at Mercato Metropolitano in Borough, Tiny Leaf are now moving on to their third residency which will be revealed soon. Luminary Bakery is a social enterprise offering opportunities for women who experience social or economic disadvantages. They aim to break generational cycles of abuse, prostitution, criminal activity and poverty, enabling women to build a future and realise their dreams. They equip their students with transferable skills, qualifications, work experience and paid employment to empower and build confidence, helping them to enter the working world. You can visit for a great coffee and delicious breakfast, lunch or baked treat. The Clink Restaurant is at the Category C prison HMP Brixton, serving a delicious meal cooked using fresh, seasonal ingredients. Designed to deliver change, this charity initiative enables prisoners to work towards qualifications in food preparation, food service and customer service, leading to employment in hospitality upon release. With reoffending rates typically above 40% in the UK, helping prisoners to secure employment upon release has been found to reduce their likelihood of reoffending. Wulf & Lamb are all about sharing food and fun with friends, whatever our prey or preferences. Their 100% plant-based menu is made up of classic comfort foods that won’t scare anyone off. With a focus on quality, their dishes are full of flavour and contain nutritious and sometimes surprising ingredients. Tibits is an amazing vegetarian buffet restaurant just off Regent Street. With salads, hot dishes, soups, dessert and juices, it’s perfect for every occasion. And every Tuesday the menu is 100% vegan, with 80% of the options vegan on every other day of the week. What are your favourite conscious eateries? Let me know by commenting below! Next Who made my Activewear?